The most widely consumed variety, Runner peanuts, have delicious flavor, great roasting characteristics and high yields – making them the most widely consumed variety of peanuts. This medium-sized peanut is an ideal choice for use in peanut butters. Runner peanuts are grown in Texas, Georgia, Alabama, Florida and Oklahoma due to their need for a warm climate and sandy, well-drained soil. Spanish peanuts are used mostly in peanut candies, peanut snacks and peanut butter. This peanut is easily identified by its smaller kernels and its reddish-brown skin. It also has a high oil content, which makes it an excellent choice for extracting oil. 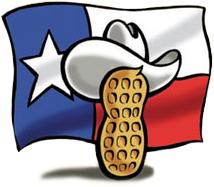 Spanish peanuts are grown mostly in Texas and Oklahoma. Valencia peanuts are a sweet peanut with a bright red skin. This peanut usually contains three or more kernels in a longer shell. Valencia peanuts are mostly served roasted and sold in-shell or boiled. While grown less frequently in the United States, its primary production region is in West Texas and New Mexico. Often called “cocktail nuts,” Virginia peanuts are considered large-kernelled. Its size makes it great for processing, particularly for salting, confections and in-shell roasting. 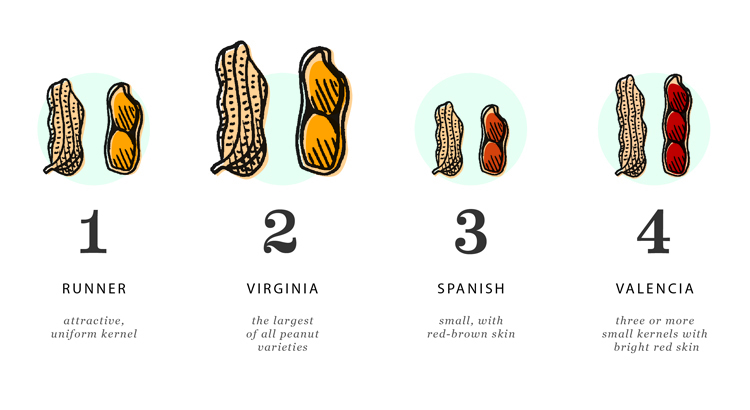 Virginia peanuts are primarily grown in Texas, southeastern Virginia and northeastern North Carolina.